Our level of service goes unmatched in the area, and we strive to give our customers the results they are looking for. Trees add many highlights to a property such as: shade, privacy, and beauty. However, when they are left unkempt they can become unsightly and even destructive to the property. That’s why it’s important to maintain trees so you enjoy their benefits for years to come. 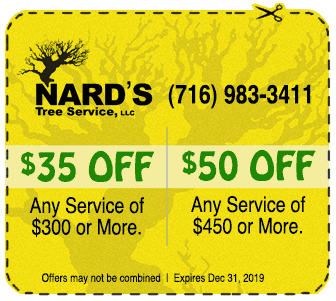 Call on Nard’s Tree Service to keep your residential & commercial treescape looking great year-round! We actively maintain our clients trees to keep them in the best health and looking great! 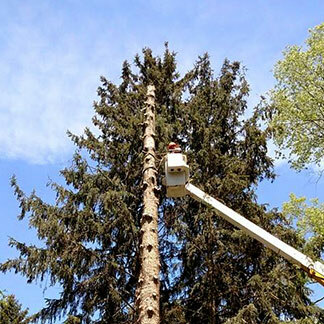 Trimming, pruning, shaping, crown reduction and removing dead wood are all part of healthy tree care. Nard’s cares for your tree in all seasons and it’s necessary to trim and prune trees to promote new growth and eliminate hazards. Fine pruning also makes trees or shrubs look better so you’ll feel better. We specialize in dead or dangerous tree removal. We will make sure that your house, vehicles, family, and friends are safe from potentially dangerous situations. Nard’s Tree Service has the equipment and crew members to grind out tree stumps and leave no trace. We also fix lawn damage caused by stumps or grindings. If you’re building a new home or have an upcoming project requiring lot clearing, Nard’s can clear your land and remove trees to your specifications. Nature can get pretty wild in Western New York with high winds, heavy snow and lighting strikes. Trees can get damaged in this severe weather and Nard’s is ready to fix the damage done. Hedges not only beautify your garden they can also protect your property from the wind and provide visual barriers for increased privacy. It is important to monitor their order and neatness through regular trimming. Nard’s will remove your overgrown or dying shrubs down to the root. Want to replace the old shrubs with new ones? We can do that too! On-call medical professionals in Alden had a tree fall across their driveway. With no way out, they called Nard’s and we sent a crew to their house immediately to remove the tree. Expect this kind of service from Nard’s when an emergency situation develops.